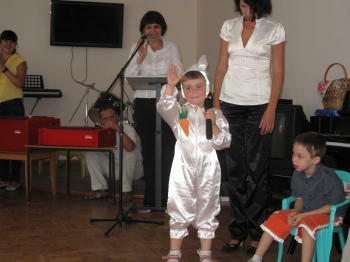 The "Revival" Centre in Chernihev, Ukraine celebrated its 15th anniversary on June 23. Regretfully, Beverly and I were not able to be present for this anniversary. Our hearts were there, however, as we have been very much involved with the Centre, even before its opening in June 1996 (http://rcn.org.ua/page.php?4). 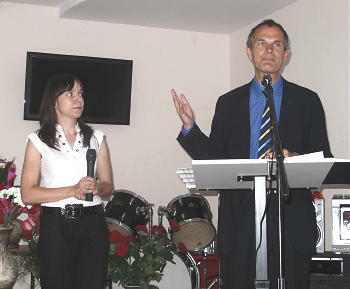 Our friendship with the founder Dr. Vasyl Pasichnyk and his wife Natalya goes back a long way over the years. You can read a chronicle of our working with this special Centre on our Website. Dr. Pasichnyk and Natalya wrote to us a week after the celebrations with this report that those that have been following our work through LifeNets here may find of interest. Our dear friends, Victor and Beverly! 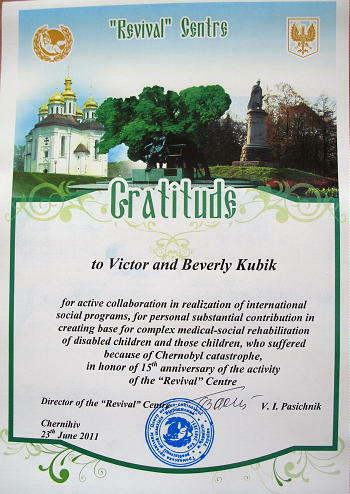 We are very thankful for the greetings we received for you for the 15th anniversary of the work of the "Revival" Center. We regret that we could not be together on this day. 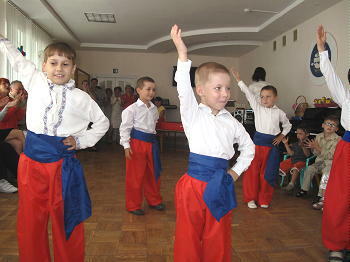 We had 14 people who came outside the borders of Ukraine. The Ambassador of Great Britain, Leigh Turner was present and he really liked the Center! 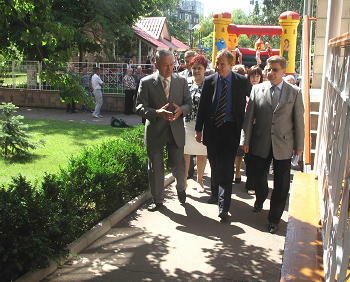 The Ambassador, administration, and other highly qualified guests valued the organization and activity of the Center. We are very thankful to you for your help in the establishment and support of the Center in doing its work. In connection with this Jubilee of your organization, the special Appreciation from the mayor of Chernihev, Alexander Sokolev and from his staff (photo attached) We are hopeful that we will meet and then we will present the original appreciation plaque. We are also sending you the photoinformation of the jubilee's meetings. Дорогі друзі Вікторе і Беверлі! Дякуємо за ваше вітання з нагоди 15 річниці діяльності Центру «Відродження». Дуже шкода, що ви не змогли в цей день бути разом з нами. З-за кордону було 14 чоловік. Був Посол Великої Британії Лі Тернер – йому дуже сподобався Центр! Посол, адміністрація, інші гості високо оцінили організацію і діяльність Центру. Ми дуже вдячні вам за допомогу у створенні Центру і підтримці його діяльності. У зв’язку з ювілеєм вашій організації оголошена Подяка від мера Чернігова Олександра Соколова і від нашого колективу (направляємо фото). Надіюсь, що ми зустрінемось і тоді ви отримаєте оригінали подяк. Направляємо також фотоінформацію про ювілейні заходи. What do Arsenal Football Club, British and Ukrainian charities, the Chernihiv regional authorities and former British ambassadors in Kyiv have in common? 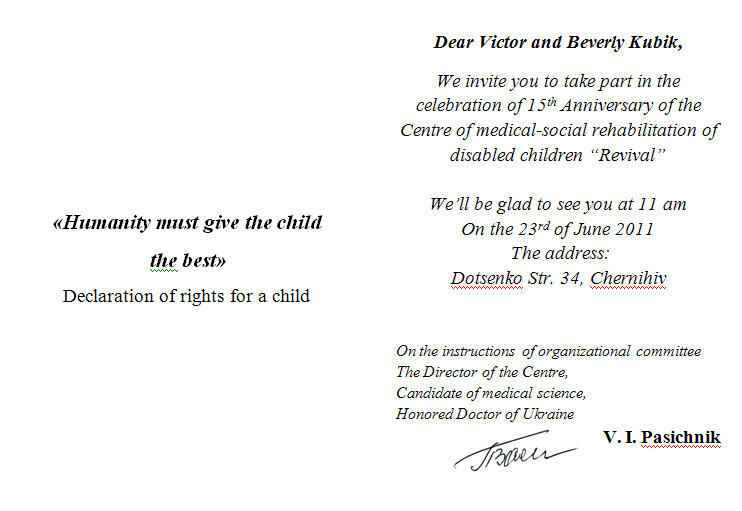 Answer: all have helped support a remarkable institution, the Chernihiv “Revival” centre for the social and medical rehabilitation of children. 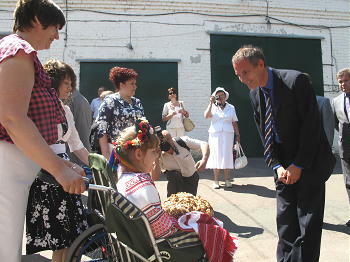 I’m visiting Chernihiv to help celebrate the 15th anniversary of the “Revival” centre. It’s an inspiring story. In the early 1990s, several British charities began working to help the centre, which had a particular role in helping children affected by the 1986 Chernobyl catastrophe around 100 kilometres away (Chernihiv is just north of Kyiv). A tour of the centre is inspirational. Specialists working with the children and their parents include neurologists, paediatricians, psychiatrists, physiotherapists, massage therapists, music teachers and speech therapists. At the entrance I am greeted by two smartly-dressed children who greet me in impeccable Ukrainian and English. The head of the centre, Dr Pasechnik, then shows me round the classrooms, where children are receiving an impressive range of teaching and therapy using modern equipment and materials provided in many cases by British charities. 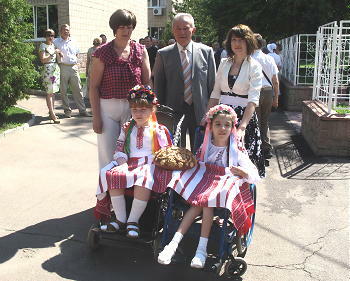 The breadth of cooperation and people-to-people links at the “Revival” centre is, together with the children themselves, perhaps the most impressive part of what is happening in Chernihiv. 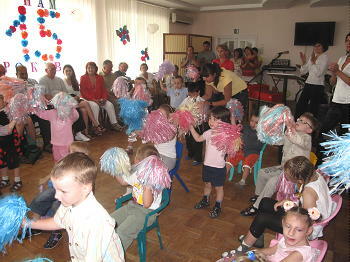 British charities such as “Felsted Aid for Deprived Children,” “Forgotten Children” and “British Aid for Deprived Children”, all run by dedicated volunteers, have linked up with counterparts in Ukraine and with the “Revival” centre and over the course of over 15 years have helped build an outstanding institution. The participation of British charities, in turn, has encouraged the development of charities in Ukraine and support from the authorities. At the ceremony to mark the anniversary, local authority representatives present awards to the British charities recognising their achievement. Charity representatives, in turn, tell me how rewarding they have found their contacts with Ukrainian colleagues and friends and the warmth of the welcome they have received. Best of all, such cooperation looks set to continue. As an example of how grassroots contacts between different countries can enrich people on both sides, it’s hard to beat.